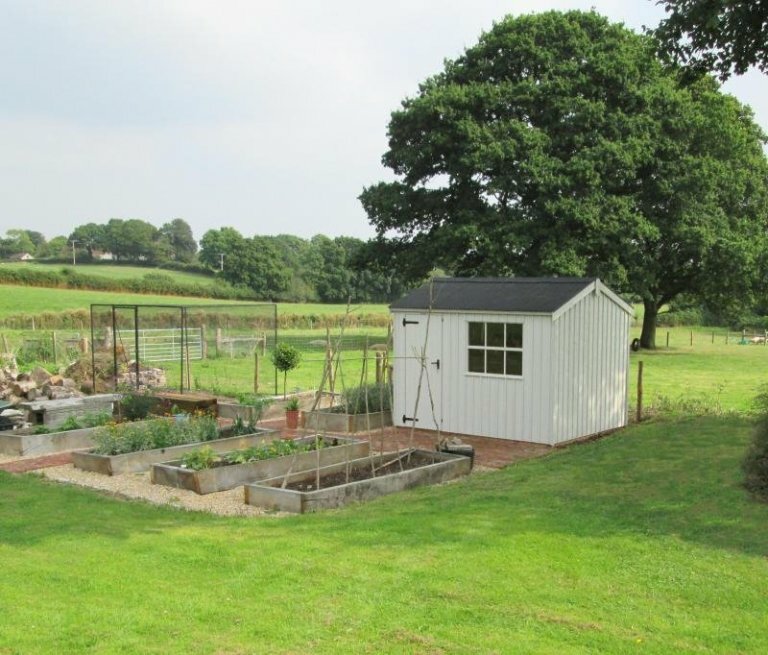 This National Trust Felbrigg Garden Shed is 2.4 x 3.0m, and it has been installed in a section of our customer’s land in Hambledon, Hampshire, with a sheep field behind it, and it overlooks the customer’s vegetable garden. The style of this National Trust Shed suits the customer’s garden amazingly well: the designs of this range were based on garden buildings situated on National Trust estates, to give them a real rustic, country, traditional feel to them. To achieve this traditional, rustic feel that suits country gardens so well, there is corrugated sheeting on the roof, the external cladding is formed of vertical, roughly cut boards, the windows are Georgian in style, and for that extra little finishing touch, the door furniture is made from black cast iron. There are six paint colours to choose from with a National Trust shed, from our National Trust paint range, all of which are natural colours that fit the traditional style. This customer chose Earls Grey, which is a pale, neutral colour that looks very fitting in this setting. The National Trust range of garden buildings have set designs and set sizes to choose from, and you can build your own by using our Online Garden Building Planner Tool. 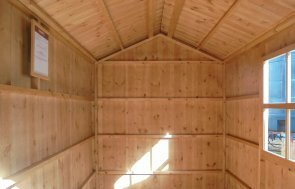 You can also come and see our range of Garden Sheds at our East Sussex Show Centre, where our friendly team will be able to show you around our buildings and discuss your requirements with you.